Reader Thomas is having a problem with his six-year-old Windows XP Professional system: When he plugs in a flash drive, Windows doesn't recognize it--but other USB devices work just fine. Before I reveal the solution to this vexing problem, Thomas, a quick slap on the wrist: you didn't give me nearly enough information in your initial e-mail. So to you and all other readers, I kindly ask that you read my Hassle-Free PC post on how to ask for tech help. You'll greatly increase your chances of a response if you follow those simple guidelines. Moving on to Thomas's problem: As it happens, Microsoft has a fix for the problem of unrecognized USB flash drives (and other external drives), which is most likely the result of "corrupted or incorrect keys in the registry." Go to the Microsoft support page, scroll down a bit until you see the Microsoft Fix It button, click it, then follow the instructions. That should do the trick! Reader Tom is dealing with this major hassle: "When I switched from Windows XP to Windows 7, I was very careful to backup my entire computer to my laptop. After installing Windows 7, I found out that it had changed its backup application, and I was unable to restore it from my laptop to my desktop. Is there a fix?" Kudos for backing up your system, Tom. Demerits for removing backward compatibility from your utility, Microsoft. It's true: the Windows 7 Backup program can't restore files created with the Windows XP Backup program. Fortunately, there is indeed a fix: the Windows NT Backup Restore Utility. I know: you didn't use Windows NT to create your backup. But the utility that came with Windows XP was called NTBackup. Be sure to download the correct version of the Restore Utility--"x86" for Windows 7 32-bit, "x64" for Windows 7 64-bit. Then just install it, run it, and point it to your backup file(s). It's not the same one each time, either. And to further confound the matter, Charles has configured Google Chrome as his default browser--so why is he seeing Internet Explorer errors? I won't spend a lot of time on the "why"--let's just chalk it up to the joy that is Windows. Weird, inexplicable, annoying things like these just happen sometimes. Click the Advanced tab, then scroll down to the Browsing section. Select the check boxes next to Disable script debugging (Internet Explorer) and Disable script debugging (Other). 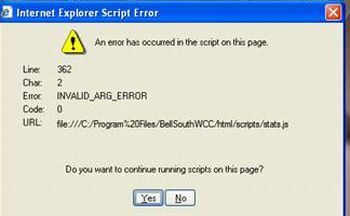 Clear the check box next to Display a notification about every script error. Those startup script errors should pester you no more.